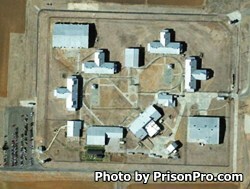 Roach Unit is a mixed custody facility located in Childress Texas that houses security levels G1, G2, and G4 inmates. Currently, Roach Unit can house up to 1,384 adult males in the main unit, 100 males in the work camp, and an additional 400 offenders in the ISF Unit (Intermediate Sanction Facility). Intermediate Sanction Facilities, ISF for short, is an alternative program designed as an alternative for those facing revocation of their probation or parole. This helps alleviate overcrowding in prison, and at the same time provides a short term in-custody treatment for those who are considered high to medium risk. Inmates incarcerated at Roach Unit are provided academic opportunities in adult literacy, adult basic education, and GED testing. Additionally, offenders may elect to take vocational training in construction carpentry, heating ventilation and air conditioning, refrigeration, landscaping, and maintenance. Several other courses are provided which teach cognitive intervention, and help prepare offenders for an upcoming release. Work opportunities for inmates at Roach Unit include working in a soap and detergent factory, and within a distribution center. Select inmates at Roach Unit are allowed to work in supervised labor positions providing services to local government agencies, the Department of Transportation, and the Texas Department of Parks and Wildlife. Inmates who are currently housed in Roach Unit in Childress Texas are allowed visitors on Saturdays and Sundays from 8am to 5pm. Visits are a maximum of two hours in duration, and offenders are limited to a single visit per weekend. Visits are restricted to two adult visitors (children under 16 do not count). Roach Unit allows visitors to bring a maximum of $20 in quarters to purchase items from the vending machines. All coin must be contained in a small clear Ziploc bag, paper currency is strictly prohibited.